The dominant decorative elements of this abundantly colorful set are sun, peppers and snow: sun for life, peppers for spice, and snow for hardship. The three are among the ordinary ingredients of the human condition, and they also punctuate the life rhythm of Southwestern Native Americans. 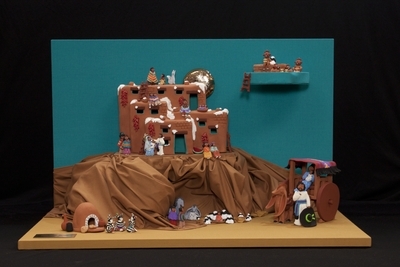 Jil Gurule’s idea of the Nativity included the whole village: the piled up little adobe homes, the flow of life, and the faces and colorful costumes of past (kachinas) and present. The Holy Family, dressed in their Sunday best is not confined to a particular space. More important, they don’t need shelter. The whole village is their home. They are an almost perfect blend, sharing sun, peppers and snow with everybody. The blend is almost perfect, with one exception. Cart and donkey are ready for the flight to Egypt on wheels. Hand painted, hand-sculpted clay figures made by New Mexico artist Jil Gurule. Figures include infant Jesus, Mary, and Joseph. Exhibition label originally written by Fr. Johann G. Roten, S.M. for exhibit entitled "At The Manger: No Place Like Home" held at Roesch Library, University of Dayton.